Tired of squinting at your iron sights to get the perfect focus? Want to acquire targets faster? Shoot better from a distance? Or maybe you just want your handgun to have a badass laser sight? Equipping your pistol with a reflex sight will give you all of the above. You’ll shoot better, and you’ll look better while doing it. Side note: It’s not that simple, of course. Red dots have their downsides as well. We’ll cover them in the “Pistol Reflex Sight Pros And Cons” section below the reviews. The thing is, choosing the best reflex sight for your handgun is torture these days. The market’s chock-full of these sights. You’ve got prices ranging from $20 to $600. You have established gun brands selling cheap Chinese sights with their logo on them. But don’t worry, SurvivalMag’s got your back. We’ve reviewed 16 different reflex sights for pistols specifically and picked the 6 best ones among them for every budget. 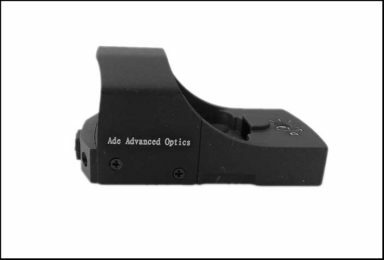 The sweet spot is around $200, expect to pay $400+ for a professional sight, cheaper sights get the job done but are generally unreliable. 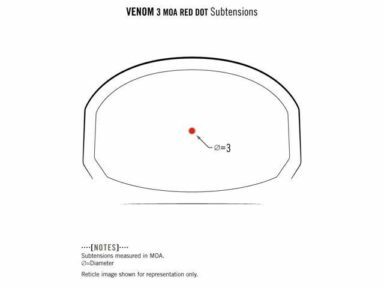 2-3 MOA dot size is the best, as larger dots will cover up your target at a distance. There are 3 different types of red dots – (1) Tritium, (2) LED, and (3) dual Tritium/LED. We prefer LED dots as they work in all light conditions and batteries last a long time. Tritium doesn’t need a battery but doesn’t work well in bright light. Most reflex sights are made to mount on Glock MOS and Springfield OSP, but this really depends on your handgun. With some, you need to buy additional mounting or waterproofing hardware which will add to the cost. Reflex sights are good for: threat focusing, shooting at the distance, shooting on the move, shooting in low light environments (including night vision), and target transition/acquisition. Downsides are: they require training, they’re susceptible to elements such as rain, and there is always a risk of mechanical/electronic failure (when compared to iron sights). Practice using your reflex sight! At first, finding the dot is hard when you pull out your gun, but you will get better with training. Especially important for self-defense. 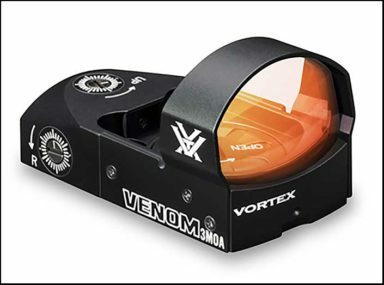 Our Pick: Vortex Venom is the best pistol reflex sight for most people. It’s as close as you’ll get to mil-spec quality without paying the price of a professional red dot. You won’t find a better bang for your buck than this. Best Overall: Trijicon RMR Type 2 remains the king of reflex scopes. Trijicon RMR beats the competition through excellent performance in all light conditions (especially night vision) and remains the best choice for professionals. It’s the most reliable reflex sight out there. Budget Pick: There aren’t many sights under $200 that are worth the money. Still, Ade Advanced Optics Huracan offers decent value for the price and is great for trying out a reflex sight to see if it’s your thing. But we wouldn’t recommend using Ade Huracan for competitions etc. because of QC issues. The good thing about tritium is that it has no battery. It relies on tritium tubes that have a half-life of about 10 years. But tritium sights can’t pick up the dot in some light conditions. Which makes them less reliable than LED dots. So if you want a red dot that will work in all light conditions, keep things simple and get yourself an LED sight. The only thing you have to worry about with LED sights it the battery. The good thing is that the battery will last you for at least a year on a proper sight, if not more (Trijicon lasts for 3+ years on one battery). Which MOA Dot Size Is Best? Bigger dots – there is a common misconception that a bigger dot will help you aim and acquire your target faster. I’m talking about 6.5 or even 9 MOA dots here. That’s simply not the case – they will not help you acquire your target faster. The main downside of a bigger dot is that you won’t be able to take a precision shot at a distance. The size of the dot is going to cover up your target – and you won’t see it. We recommend 3 MOA dot or smaller – Because it can do everything that a bigger dot can do, and will allow you to take precision shots at a distance. If your dot’s not visible enough, you just dial up the brightness. Basically, a 3 MOA dot will do what the 6 MOA dot does, but not the other way around. The easiest and the cheapest way is to get a Glock MOS. It’s already cut out for the red dot sight and you won’t need to make any additional modifications. With other handguns, it’s going to depend on the model. Most sights fit Springfield OPS as well. Sometimes you’ll need to get an additional mount for the scope. And after reviewing the quality, here’s what we have to say about each of them. Every red dot in this price range is mass-produced in China. We’re lumping them all together because you won’t see a significant difference in quality between a $100 red dot and a $40 red dot. It’s the same models from China sold under different brands. Most of these cheap sights work and even hold their zero. But they’re not durable, and they’re not reliable. You never know when it’s going to lose its zero or break down on you. Defects are common. At the end of the day, you’re better off saving up some money for a proper sight than going for one of these. This is the sweet spot when it comes to bang for your buck. These are your competition/recreational red dot sights with Burris Fastfire III and Vortex Venom leading the way. They’re both good sights that check all the boxes. Best choice if you want a sight that you can rely on, but you don’t feel like shelling out $400-$500 for a Trijicon or a Leupold. Compared to the $400+ category, build quality and dot glare on higher illumination settings are the main shortcomings of these sights. If you drop your gun with one of these on, you can still lose your zero and/or break the sight. In this price range, you’re getting legit field/duty use scopes. They’re often U.S.-made according to military specs and will handle anything you throw at them. These sights have virtually no downsides and will last you a lifetime if you take good care of it. This category is where Trijicon RMR, Leupold DeltaPoint Pro, Sig Sauer Romeo 1 and Vortex Razor live. And a solid brand that stands behind their products with a lifetime warranty. Most importantly, Vortex Venom has been used and abused in the field for years – handling anything from competition shooting to tactical training – and it never fails to impress, especially when compared to more expensive reflex sights. But what makes Vortex Venom better than the competition – especially Burris FastFire III that retails for about the same price? Vortex Venom and the runner-up Burris Fastfire III are practically equal in terms of their quality, price, and features. Both reflex sights have crisp dots and have no trouble retaining their zeros though longer shooting sessions. They’re both great, time-tested beginner reflex sights. You have people vouching for both of them. A larger field of view – The glass on Vortex Venom is lower and wider than on Burris Fastfire III. The larger lens gives Venom a slight edge over Fastfire III – it is better for target acquisition as it will capture more of your field of view. Better brightness controls – You get an up and down brightness control on Vortex Venom with 8 different illumination settings. Burris Fastfire only gives you one button for changing between 3 illumination settings. Better auto mode – More brightness levels on Vortex Venom means that there is a smoother transition on auto-brightness mode. Longer battery life – Vortex Venom comes with a reported average 15,000 hours of battery life which is more than Fastfire’s reported 11,000 hours average. Additionally, short battery life issues are more common with Burris FF III than with Vortex Venom. The auto power off feature hits in after about 14 hours of use to save battery. The sight is easy to adjust. Standard windage and elevation adjustment dials give out an audible click when you turn them. 1 click = 1 MOA. Battery access from the top – no need to unmount the scope to change the battery. Changing the battery is the most common complaint with Vortex Venom. Some people find it difficult to fasten the cap without cross-threading. You’ll have to apply some force to screw down the cover. With higher brightness settings your dot will get larger and won’t be as crisp. This is normal and will happen on all scopes in this price range. Finally, defects happen as these sights are made in the Philippines. But Vortex is known for offering one of the best warranties on the market. If your product is not 100%, you will get a replacement in no time. At half the price of a military red dot, Vortex Venom is a bargain. You won’t find a better bang for your buck than this. Burris Fastfire III is the only dot that comes close, but Vortex Venom is the clear winner out of the two for us. Burris FastFire III is another good reflex sight for the money, but lands slightly below Vortex Venom in our ranking. The dot is visible in all light conditions, including on a bright sunny day. Auto adjustment of the brightness works well when moving from the shade to bright light. Simplicity is one area where Burris Fastfire III does beat Vortex Venom. With one button for brightness adjustment and one button for auto-mode, FastFire III is easier to operate. Especially your firearm is concealed, you’d have no trouble adjusting the illumination without taking it out. Three illumination modes are easier to remember and one illumination adjustment button is easier to operate. Battery access from the top means that you don’t have to remove your scope when changing the battery. No re-zeroing. There are no clicks when you’re adjusting elevation/windage. The battery life may not be as long as advertised. I’ve seen reports that if you keep this one on Auto mode, the battery will last anywhere from 350 to 1,000 hours (as opposed to the 11,000 hours they advertise). The red dot blurs and loses its form on higher brightness settings. You can have quality problems. But like Vortex above, Burris offers a lifetime warranty and will replace any product that is not 100%. Get Burris Fastfire III if you want a scope that you can adjust while your gun is concealed. Otherwise, Vortex Venom beats it in every regard. 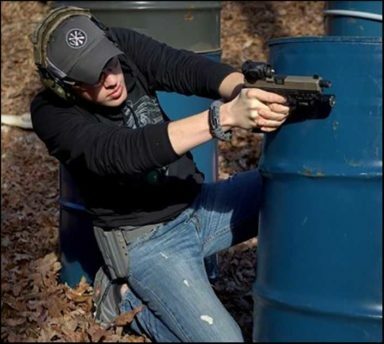 Trijicon RMR is the KING of reflex sights. This is a proper military red dot. It will always work when you need it to. Trijicons are known for being the most expensive red dot sights, but they’re well worth the money if you’re looking for the best reflex sight out there. 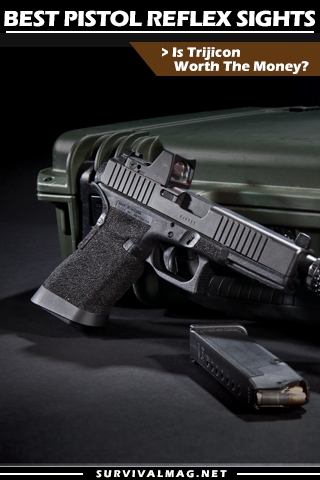 Trijicon RMR is probably the toughest red dot out there. The casing on Trijicon is thicker than Leupold Deltapoint, Sig Sauer Romeo 1, and Vortex Razor – sights that are all in the same weight class when it comes to price. It will stand up to any kind of abuse without losing its functionality. This is not a sight that you have to be “gentle” with. The quality of optics is top notch – the screen has a bluish tint and is very clear. Not as clear and big as on Leupold DeltaPoint Pro, but then again Trijicon RMR works well with night vision while DeltaPoint Pro doesn’t. Controls are easy to use. There are 8 manual settings for brightness, as well as the auto-adjust mode. From my experience, the auto mode on this one works better than on cheaper sights like Burris and Vortex. I used to have a Trijicon RMR on my EDC Glock with the auto setting on 100% of the time. The dot had no trouble adjusting to light conditions automatically – it’s bright enough in the sun and dim enough in the dark. Trijicon comes with 3-5 years of battery life. On a single battery. I don’t know how they do it, but that battery life just blows their competition out of the water. Side note: Imagine this – you get a reflex sight when you’re 30 and the next time you have to change it is when you’re 33. Incredible. You have to unmount the sight to change the battery. Not a big problem, considering that you only need to do it once in 4 years. The window is smaller than on some of the competitors – DeltaPoint Pro and Vortex Razor. Note that you’ll have to buy the waterproofing sealing plate separately – it’s not included with the sight. 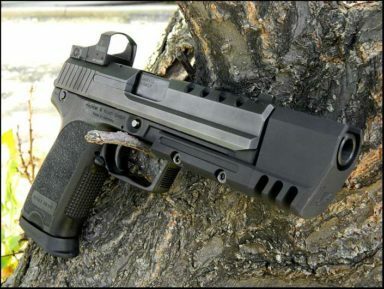 For Glock MOS or Springfield OSP, you need to get this one instead. If you go for Trijicon RMR, make sure you go for type 2, not type 1. Type 1 is the previous version and had problems with shock-proofing on the battery. So the laser would start to flicker when shooting. Of course, Trijicon replaced the defective sights back then, but now they seem to have fixed the problem with their Type 2. If you want these, go for the Trijicon. But if you don’t need the night vision and could live with shorter battery life, check out the Leupold DeltaPoint Pro below. 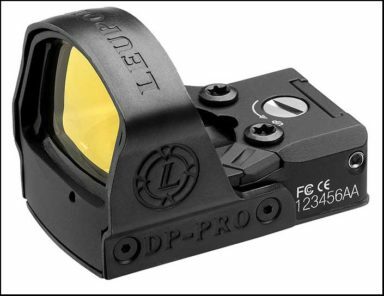 Leupold Delta Point Pro is another professional reflex sight and a strong competitor to Trijicon RMR. Both sights are top of the line when it comes to quality and features. And while Trijicon RMR is better overall, Leupold retails cheaper and has a couple of important upsides over the RMR that I want to talk about. Leupold has a bigger, clearer glass than the Trijicon RMR above. The unobstructed, wide field of view will let you acquire targets faster. Dot performance is 90% – it works in all light conditions except for night vision. Maybe you need it, maybe you don’t – that’s for you to decide. But if you need night vision, then definitely go for Trijicon. There are 8 illumination settings along with an automatic setting. Motion-sensed activation is a battery-saving mode that other sights don’t have. In this mode, Leupold stays turned off until you move your firearm. The slightest movement will activate the laser – good for reacting at a moment’s notice. The battery is top-changing and you won’t have to remove your sight to change it. Adjusting elevation and windage is easy and you can hear audible clicks when you turn the screw. Great warranty – you get a lifetime warranty from Leupold on the scope. But note that Leupold doesn’t cover shipping costs when you send the scope back for the warranty. Finally, the sight comes with a very nice rubberized cover to protect it in storage. The sight doesn’t perform well with night vision. What happens is that the glass of the sight reflects the dot too much and it’s impossible to get a good aim with it. See the video below for more info and a demonstration. DeltaPoint Pro comes without the mounting hardware, so you’ll have to purchase it separately. The button to change brightness is right in front of the window. When changing brightness, you won’t see the result right away, because the window will be covered by your finger. It’s not a critical flaw, but I prefer laser dots with buttons on the sides. You can expect around 6-12 months of battery life out of this sight. Battery life is another area where DeltaPoint Pro is weaker than Trijicon RMR. Am I going to use this with night vision? Do I need a 3-year battery life? 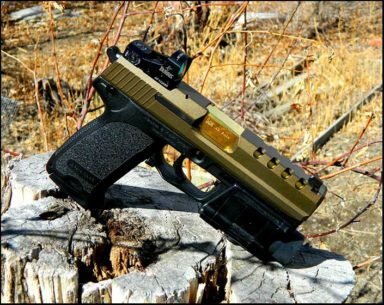 If you answered “yes” to either one of these, skip Leupold and go for Trijicon RMR. Otherwise, Leupold’s your thing. “Advanced” is not the first word that I would use to describe ADE’s Huracan reflex sight. It’s a budget Chinese-made reflex that comes with the bare necessities. Some people compare these to Burris FF 3 and Vortex Venom, saying that ADE gets the job done for a quarter of the price. This red dot is bigger and heavier than Burris/Vortex. But the most important thing to know about ADE is that it works… unless you get a defective model. The sight holds its zero on firearms, which can’t be said for other budget sights. There are 5 illumination levels. The sight has memory – when you turn it on it activates on the last setting. There is no auto mode. You have the standard windage/elevation adjustments. The dot is slightly distorted when compared to more expensive scopes, but at the end of the day it still looks like a dot and works fine. The sight shuts off automatically after an hour to save battery. Quality problems are common – the sight turning off and losing its zero. Unlike the companies above, ADE doesn’t come with a lifetime warranty. Inspect your unit carefully when you get it. You might have to purchase a separate adaptor plate for this sight – for which you’ll have to pay extra. And don’t expect much from the battery – I’ve read reports of it failing after a few weeks. To change the battery, you’ll have to take the sight off the gun. Keep in mind that getting a cheap red dot is a bit like playing the lottery – you never know if you’re going to get a defective product or not. ADE’s sight gets you decent value for your money – if you keep an eye on defective models and send them back. It’s also a good sight to try out red dots for the first time. 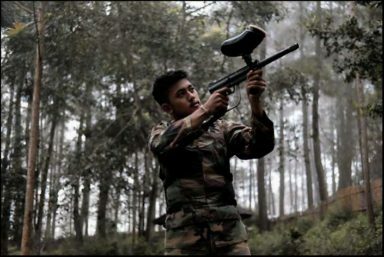 Ohuhu’s Red Dot is one of the many Chinese mass-produced red dot sights on the market. This model is sold under many different brands and retails for around $20. Ohuhu’s version is the most popular, so I decided to take a closer look myself. The start looks promising. The case is made out of aluminum, which is a decent deal for what you’re paying. But generally… the reviews on this sight are mixed. On one side you have people saying that they’re impressed with the quality. But I suspect that these people didn’t use the sight. Or didn’t use it on a firearm, at least. It’s hard to recommend Ohuhu for guns – even for pistols. This sight is made for airsoft, BB and crossbows. Not guns. It will lose its zero and who knows what other problems you might encounter. Then again, this sight can give you the basic idea about how reflex sights work – and whether or not you’d want to use one at all. So, if you’re a beginner and you don’t know whether you should get a red dot for your gun – that is the one scenario where I can recommend Ohuhu. But even then you’re better off going with ADE. 1. Shooting at the distance – Red dots are unparalleled when you’re shooting at the distance, especially when compared to iron sights. 2. Shooting on the move – Shooting on the move with accuracy is easier with the red dot – for obvious reasons. 3. Target transition/acquisition – Target transitions are slightly easier with a red dot, at least in my experience. There are many people arguing about this, but I’ve found mine to be better with a red dot, rather than without. 4. Shooting in low light environments – This is one of the greatest advantages of the red dot. An important thing to watch out for is not having your red dot turned up too much. If your dot is too bright for the environment, it will blind you completely when you present your gun. You have to know your operating environment beforehand so that you can adjust your dot brightness accordingly. 5. Night vision – When you have night vision with a red dot it is very obvious where you’re aiming. But of all the red dots on the list, I’m only 100% certain about Trijicon RMR performing in night vision settings. 6. Threat Focusing – Finally, red dots allow you to threat focus better. It’s extremely difficult to aim properly in real-life situations where you’re being threatened by an actual attacker. Because, when you’re pointing your gun at the attacker, you’d have to pull your focus away from the threat to the sights of your gun to aim properly. And that’s hard to do, especially without professional training. You’re “focusing” on the threat. A red dot will allow you to ignore your sights. You just look on your red dot and it’s right there on the attacker. The ability to threat focus is probably the most important upside that you get from a red dot sight, especially if you’re planning to use it for self-defense. You need to train to use red dots – If the alignment of your handgun is wrong when you pull it out, you won’t see the red dot at all. It’s susceptible to the elements – If a little drop of rain falls on the spot where the LED is coming from, it will distort the laser. If anything got in the way of that laser – like a leaf or a feather – you could lose your dot completely. It’s unlikely, but with iron sights you can be 100% sure that this won’t happen. Red dots run on batteries and batteries can fail – The good news is that batteries on these are designed to last for years. If you switch the battery every six months (just to be sure) you’re going to be fine. Mechanical/electronic failure possibility – There are electronics inside this thing – a contact can go out, the glass can break, and so on. Especially if you knock it against something… these things are not failure-proof. Could potentially lose its zero – This is a possibility on cheaper scopes and doesn’t generally apply to more expensive/professional ones. For me, the good sides of red dots on pistols far outweigh the negatives. Especially if you plan to use your pistol for self-defense, getting a red dot is well worth it just for the ability to properly threat-focus in a critical situation. As for the picks, you can’t go wrong with Vortex Venom. A couple of years ago, you would mostly see red dots on rifles and shotguns. And I don’t know what changed. But I’m seeing way more red dots on handguns these days. And I like where this industry is moving. I’m hoping to see some new models hit the market soon.